This is a sponsored post written by me on behalf of ConAgra. All opinions are 100% mine. Need a filling dinner in a pinch? This easy taco bites recipe can be whipped up in 15 minutes or less and is the perfect way to use up your leftover chicken! This filling dinner will help make dinner fun again, and attainable without spending hours in the kitchen! Warm the corn tortillas in the microwave for 30 seconds to soften them. 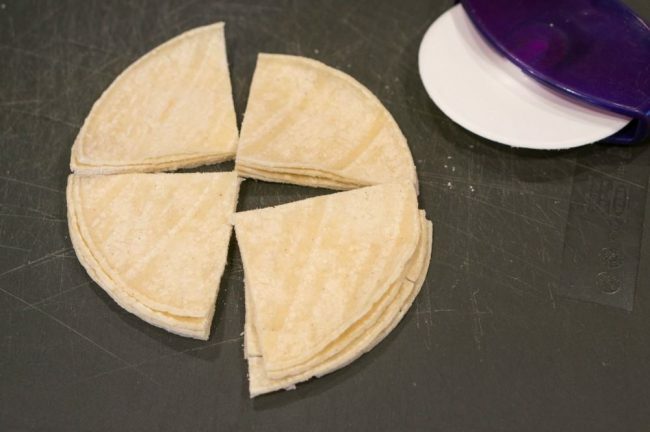 Cut into quarters with a pizza cutter. Evenly coat a mini muffin pan with PAM cooking spray. 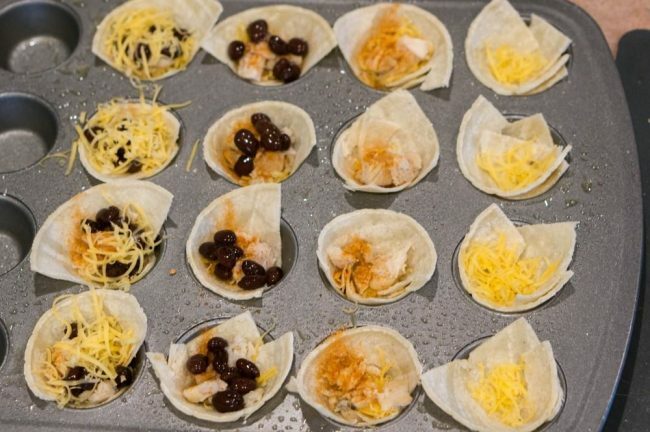 Fold your corn tortilla triangles into each individual mini muffin tin spot. Add a little bit of cheese, then layer your diced cooked chicken. This is a perfect use for that leftover cooked chicken! Plan a night or two ahead of time and cook up an extra half pound of chicken to use with your bites! Sprinkle a dash of taco seasoning on top of the chicken, if not already seasoned. Next, layer black beans and cheese. Bake at 350° F for 7-10 minutes, until your cheese is melted and all the ingredients are warm and toasty! Once your bites are out of the oven, you can garnish with your favorite toppings! 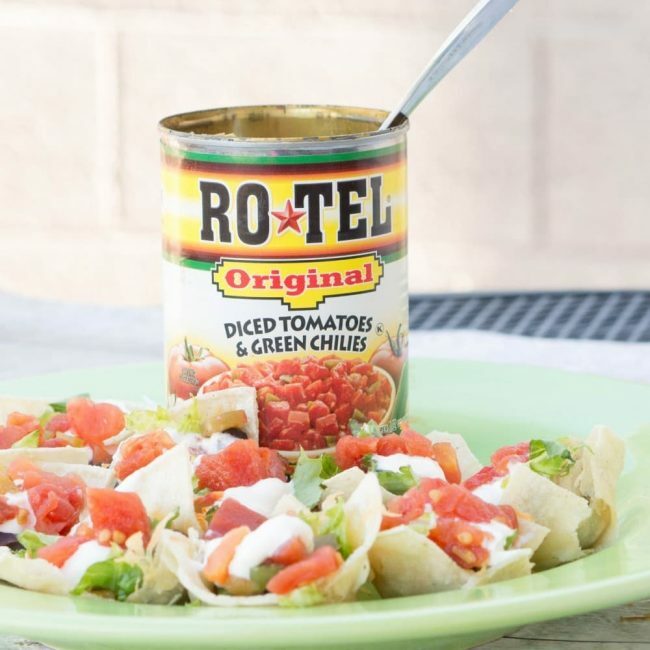 We added a pinch of lettuce, a small scoop of sour cream, and the topped our bites with ROTEL Diced Tomatoes & Green Chilies. Make sure you drain your diced tomatoes well. Then, it’s like a bite of salsa on top, without being runny! 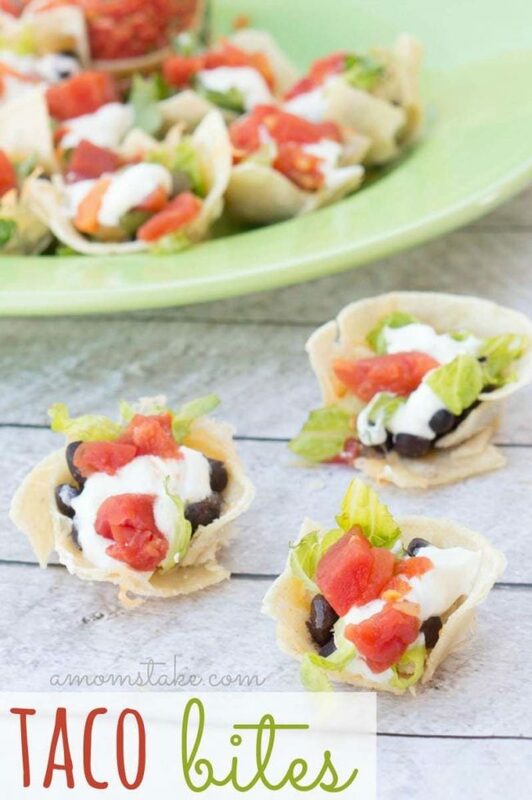 These yummy bites are perfect for a family meal, a great dinner for college roommate or newlyweds, or perfect for an appetizer for a fun gathering. No matter when you serve them, you’ll have a delicious meal or snack in less than 15 minutes! Join in with ConAgra during the #GreatAmericanCookIn Challenge where people can make a pledge to “cook in” for one week during the month of May! It may seem intimidating, but with easy meals and inspirations, you can prepare fun meals quickly that will help you save money, spend time together around the dinner table, and be better for your health and time! You can join in the challenge by sharing your cook in meals each day with the hashtag #GreatAmericanCookIn on Twitter and Instagram. You can find inspiration, recipes, tips to save money, and even ideas to help planning meals ahead of time at Forkful.com. to help you with the challenge. Mark your calendars for May 25th when you will be able to join in ConAgra’s LIVE Cook-A-Long to help you find and create your own “Cook In” recipes to help you with the challenge! These would be a great hit with my family as we like finger foods. 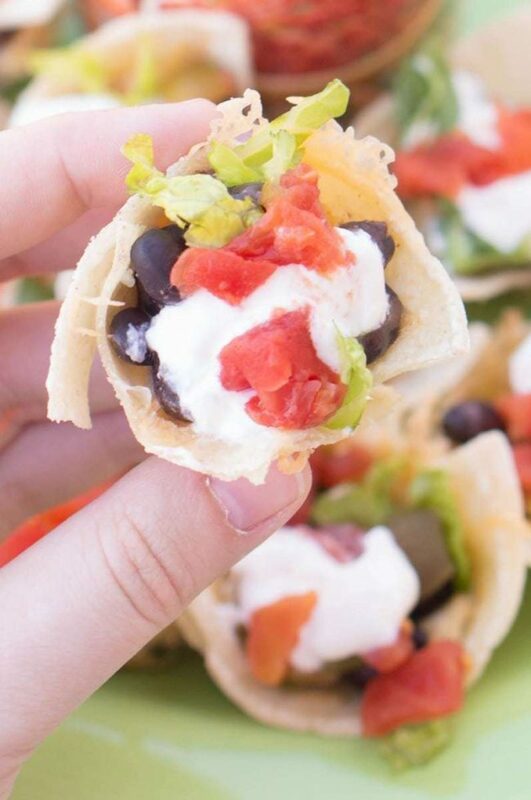 These taco bites look so delicious and easy to make. I would love to make these with my daughter and have it for dinner! I love little bite! They make great snacks or apps. I’ll have to try this recipe! Thanks for linking up at Welcome Home Wednesdays! See you next time! We love easy dishes like these! Thanks for sharing at Merry Monday! These look delicious. I love anything taco related! Thanks for sharing at the Monday Funday Party!! We all love Mexican food & will so enjoy these! This is such a great idea! My kids love mini-food. And, it’s a big favorite of mine, too. My family loves tacos so much! These bites would be such a hit from all of them! These taco bites are such a great idea. They are a nice way for you to have several kinds of tacos at one time. These sound so yummy! My kids would love them, they love anything their size! The best recipes are definitely the easiest! This looks yummy and quick! Tacos are a family favorite. I will have to get the ingredients i need so i can make this recipe. This is going to be a big hit with my family. I will have to try them tomorrow night. This looks so delicious and easy to make. I will have to give it a try on the weekend. My kids are going to love them. Those look really good. I love that they’re bite sized too. This would make for a great dinner! I’m sure my family would love it. Oh these are perfect. 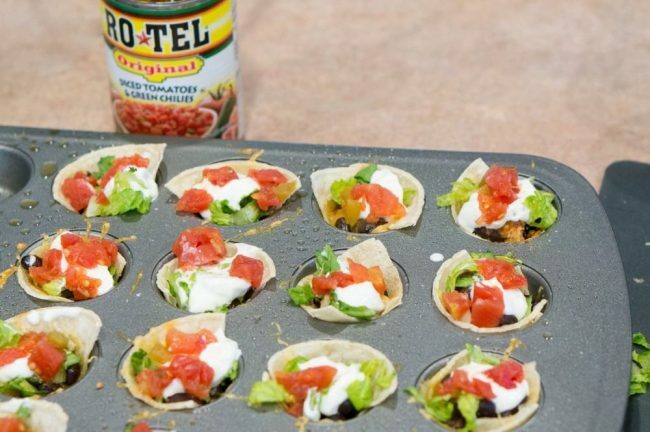 I’d love to make a tray of these little taco bites. They look so good! I love tacos SO much! I really like having app type foods for dinner so this is great. This is exactly the kind of food my family loves to eat on game days and movie nights. I’ll be making these in the very near future. These are so cute!!! I would love to make these are our next BBQ, bet they would be a hit. I like this – thanks so much! This looks so simple I don’t know why I never thought about doing that myself. I know what I’m gonna make for dinner tonight thank you for sharing this. Those look so good! I can’t wait to make these. Easy and tasty is always a winner in my book. We adore Mexican food in our house. These would be a big hit around here!